Personal protective equipment (PPE) provides an active barrier to protect staff from direct contact with hazards; thus, appropriate PPE use is a critical component of ensuring staff safety, as well as USP compliance. This article is Part 2 of a two-part exploration of how to choose proper HD PPE to ensure USP compliance. While Part 1 discussed appropriate gloves, gowns, shoe covers, sleeve covers, donning and doffing, and PPE disposal, Part 2 reviews appropriate options for respiratory protection, eye and face protection, and hair covers. Respiratory protection is a critical and often overlooked component of PPE. The most important statement addressing this within USP <800> Hazardous Drugs—Handling in Healthcare Settings is: Surgical masks do not provide respiratory protection from drug exposure. These masks should not be used when respiratory protection is required. Surgical (paper) masks are available in a number of styles (eg, molded paper mask, tie paper mask, ear loop mask) and are composed of a variety of materials. While available in a variety of designs for specific applications—such as sterile compounding—surgical masks are not appropriate for hazardous applications. Thus, it is important to understand that while use of paper masks may be common practice, these masks do not provide sufficient respiratory protection to addresses the complexities of HD handling and should not be used for this purpose. Respiratory protection should be strongly considered when the risk of inhalation exposure is high, such as when cleaning up large spills, conducting the USP <800> four-step cleaning process for isolator underpans, accessing plenums of PECs, or if there is a known or suspected aerosolization of powders or vapors from drugs. There are advantages and disadvantages to each type of respirator; employers should select the type that is best suited to the work setting. “N”-classified filters are not resistant to oil, while “R”-classified filters are somewhat resistant to oil. Filters that remove at least 95% of particles are given a 95 rating. USP recommends utilizing fit-tested, N-95 respirators for most activities surrounding HD handling. 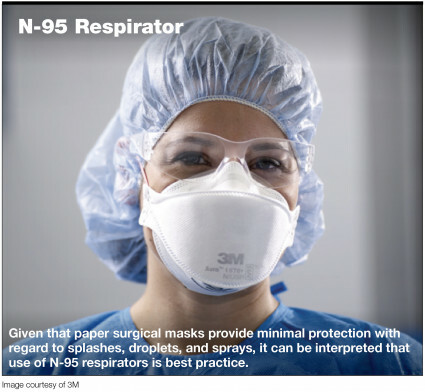 Given that paper surgical masks provide minimal protection with regard to splashes, droplets, and sprays, it can be interpreted that use of N-95 respirators is best practice. Each employee who may use these devices must be fit-tested annually and trained on how to properly use the respirator. If an employee has any change in facial hair after being fit-tested, they will need to be fit-tested again to ensure the sizing and seal is appropriate. An R-95 respirator is an alternative to the N-95 respirator. 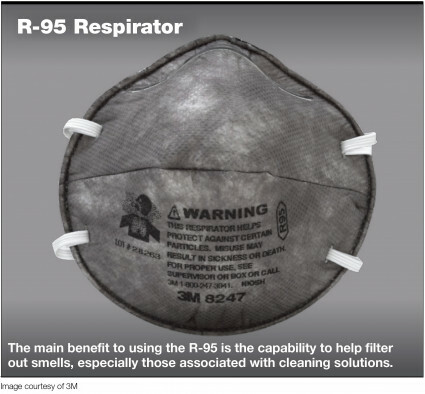 The major difference between the two is that the R-95 mask incorporates the use of carbon/charcoal, which offers the ability to help filter out smells, especially those associated with cleaning solutions. Per USP <800>, to protect against gases, vapors, and direct liquid splashes, a full-face mask with a chemical cartridge-type respirator or a powered air-purifying respirator (PAPR) should be utilized. A PAPR is defined as an air-purifying respirator that uses a blower to force the ambient air through air-purifying elements to the inlet covering. A PAPR may be loose- or tight-fitting. Loose-fitting PAPRs do not require fit-testing, while tight-fitting PAPRs must be fit-tested. A PAPR cannot protect if worn improperly, if the battery is not charged, if filters are saturated or loaded, or if the head cover is damaged; in addition, PAPRs should not be used in an oxygen-depleted environment. Sites should strongly consider the best practice of having these units available for staff in the event of a large spill, for thorough cleaning of PECs, and if there is known or suspected exposure to powders or vapors. USP encourages sites to follow all the requirements noted within the Occupational Safety and Health Administration’s respiratory protection standard (29 CFR 1910.134) when choosing the appropriate protection device(s) (see online-only SIDEBAR). Hair covers and facial hair covers are designed to contain and prevent hair from entering ISO-rated and compounding spaces. Head hair covers should be worn regardless of the quantity of hair on the head. To work properly, the hair cover must cover and contain all hair. Facial hair covers must cover all facial hair, with the exception of eyebrows and eyelashes. If sites are unable to identify a satisfactory facial hair cover, a hooded head cover can be combined with a facial hair cover to maximize coverage. If you can see the hair of staff working in ISO areas (hint: check floors, room corners, mops, and vents), those employees are actively contaminating the areas. For sites that struggle to contain hair, consider adopting a hood-type hair cover as a best practice. The goal of using eye and face protection is to minimize dermal and mucosal exposure. Note that while masks are available with an integrated face shield, these devices do not provide the required defined minimization of dermal and mucosal exposure to HD spills and vapors and should not be used for this purpose. Nursing and housekeeping should consider using eye and face protection when changing linen that is noticeably contaminated with body fluids. Anti-fogging, tight-fitting goggles are preferable to safety glasses, which do not offer adequate protection from splashes or sprays. Proper use of PPE is not only a USP requirement, it is imperative to ensure the health and safety of our employees. As such, USP compliance and employee protection and comfort should be the primary considerations when choosing PPE; cost should be a secondary consideration. With the new official implementation date of December 1, 2019 for USP Chapter <800> Hazardous Drugs—Handling in Healthcare Settings, organizations must address PPE compliance now. USP General Chapter 800 Hazardous Drugs—Handling in Healthcare Settings. www.usp.org/usp-nf/notices/general-chapter-hazardous-drugs-handling-healthcare-settings. Accessed May 10, 2017. NIOSH. NIOSH Alert: Preventing Occupational Exposure to Antineoplastic and Other Hazardous Drugs in Health Care Settings. Cincinnati, OH: US Department of Health and Human Services, Centers for Disease Control and Prevention, National Institute for Occupational Safety and Health. DHHS (NIOSH) Publication No. 2004-165. www.cdc.gov/niosh/docs/2004-165/pdfs/2004-165.pdf. Accessed May 10, 2017. Selection of respirators. This paragraph requires the employer to evaluate respiratory hazard(s) in the workplace, identify relevant workplace and user factors, and base respirator selection on these factors. The paragraph also specifies appropriately protective respirators for use in IDLH* atmospheres and limits the selection and use of air-purifying respirators. *Immediately dangerous to life or health (IDLH) means an atmosphere that poses an immediate threat to life, would cause irreversible adverse health effects, or would impair an individual’s ability to escape from a dangerous atmosphere.